This is an after action report for the dungeons and dragons game I am playing, the dungeonmaster started the game based of the story as written in the Red Box, so it might be familiar to you. The first part is the start of the Red Box from the player’s perspective (in this case, me), which I will be writing in the ‘I’ form, after that when the party is formed I might switch to writing in the ‘we’ form occasionally. At the time of writing, I have only played two sessions (three if you count the one from the Red Box where I made my character). This blog-post is about what had happened during the first session. The story starts at the beginning, with the scenario from the Red Box that serves as a tutorial and guide to create your character. The map at the start of this post shows some of the places that we visited, it is a map that I will update in future instalments of this adventure. It all started when I was riding on a wagon to the city of Fallcrest, sitting next to me was a dwarf named Travis. Making conversation with him wasn’t easy, it was impossible. In the end I comforted myself with the silence until I heard the sound of an arrow impacting the wagon. I realised that it was an ambush, quickly I grabbed my great axe and jumped on the ground to engage my opponents. After striking down all the goblins that had surrounded the wagon, I turned my attention to my travel-companion. Travis was hit by an arrow in the shoulder, unable to lift himself up, I pulled him from underneath the wagon and put him back on his feet. Meanwhile, one goblin wasn’t quite dead, I grabbed him by the collar and demanded him telling me who had send him here, he was too scared to tell me. My intimidating actions weren’t entirely fruitless, the goblin did say where his lair was just before he died. By then Travis called me to him and said he had lost a small chest that held something very precious to him, I agreed to return it to him, for a price. We parted ways there, I would go to the goblin lair while Travis went to Fallcrest to get his wounds healed. While walking towards the place that the goblin had described to me, I saw a man on horseback shaking his fist at me in the distance. The man took off as quickly as he appeared, leaving me in doubt, should I pursue him, or reclaim the stolen item? Little did I know back then that everything was intertwined. My allegiance was with Travis, so I decided to head on to the goblin cave. Once there I was able to defeat the sentries, but I realised that if I wanted to enter the cave, I should get some back-up. 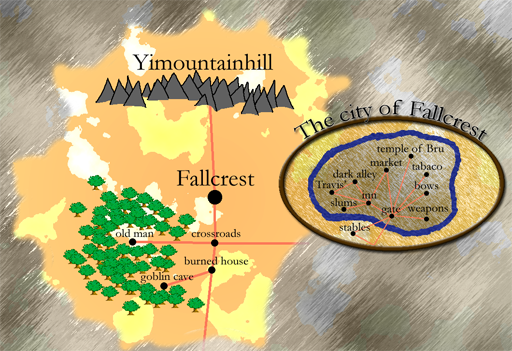 With a feeling of defeat I changed my direction to the city of Fallcrest. When I arrived at the city of Fallcrest, it was dark and the gates were closed. The guard didn’t want to open the gates because he claimed there was no more room for strangers. He did point me in the direction of the nearest stable where I could stay the night. After dumping my stuff at the stable and making a bed from hay, three misfits entered the stable, also looking for a place to sleep. We exchanged introductions, a rogue dwarf named Zalgius, another dwarf named Ulrig and a human cleric named Arcoda. For some reason, the latter one had a lot of pitchers of ale on him, which we drank during by the fire we just made. It became clear to me that I could use their help to get the chest for Travis, so I asked if they were willing to help. Ulrig said he was too old and left the next day, never to be heard from again. The next day, my newly formed party (that I dubbed ‘Greatbeard & Co.’) entered the city. The guard suggested we talked to someone at the inn to find out more about the goblins that had been plaguing the countryside for a while now. Before doing that we headed to the market where I had my hand read by a fortune-teller, she was a scam and I lost 5 gold pieces. When we arrived at the inn, Zalgius returned my lost gold to me that he had retrieved for me, I shamefully accepted. After conversing with the inn-keeper and the bard we had gathered enough information for our next step. Apparently, there was an old man living in the woods who was an expert on goblins. After spending the evening at the inn, where Zalgius and I made Arcoda pay for our drinks by deceiving the inn-keeper, we headed to our rooms to spend the night there. I can assure you that a bed is a lot nicer than some hay spread out on a stable-floor. The next day we left Fallcrest and headed to the house of the old man who was living in the forest. At the crossroads just south of the city we were attacked by goblins, by then it became obvious to me that someone did not want us there. Battling was a lot easier now with my newly made friends, the goblins were never to be heard from again. After the encounter, we headed west and entered the forest. The house of the old man was really small, so we had difficulty finding a place to sit down. The man said he used to be an adventurer like us, but now he is too old to hunt goblins. The son of the old man was working in the city of Fallcrest as a postman and we were asked us to persuade him to visit his father some day. The walls of the house were decorated with all kinds of goblin paraphernalia. When looking back at it, visiting the old man wasn’t very helpful besides the fact that he gave us a map of the goblin cave. We spent the night sleeping on the floor, because we had convinced the man that it was too cold outside. The next day we headed of to the goblin cave. There was no light as we had stepped in what seemed to be a small room. We all lit our torches that we had in our adventurers-kits, and were greatly surprised to see that the inside of the cave turned out to be very different from the outside. One could not imagine that a rocky inlet lead too a collection of fine rooms that were all well connected to each other. The light also brought something else to our attention: we were not alone. A small group of goblins and a dragon that somehow fitted in the narrow corridor, decided that they did not like our presence. The fight was really intense because there was no room to move around in the small room and corridor, but we won eventually. We walked around the many rooms and corridors clearing the place of evil until we arrived at the other entrance and found a man standing there that approached us. The man (who looked like a wizard), by the name of Jigsin, told us that he was here too kill the evil wizard Marolef. We enquired who this Marolef was as we had not heard about him before. Apparently, this Marolef person was the man who was tormenting the the countryside of Fallcrest with his army of goblins. He might also be the same man I had seen the day before in the forest. Although Jigsin seemed trustworthy, my gut told me he was working for Marolef, or that he was Marolef himself, unfortunately my party-members agreed to have him join our party and they did not let my great axe discover the truth. We had to solve some puzzles that were difficult for me to understand, as I am not that smart I accidentally burned myself and took some damage. Fortunately we had Arcoda with his wisdom and intelligence to solve the puzzles without getting all of us killed. I think he shouldn’t be so cool about his ability to solve problems with his mind, in this world, it is better to have muscle like me.